Along the north coast of Cuba, from Gibara westwards with some participants of the Cyclists for Cultural Exchange (CCE) tour as well as Ana Beatriz, César and José from Gibara. A rough track within sight of the surf and between individual wind energy generators. They have clearly indicated the wind direction and strength on the way there and were a warning to us for the efforts of the return journey. Everywhere ruins of hurricanes of recent years. The houses are now rebuilt with greater distance to the water. The people wander away from the shore. On the way, I will spend a lot of time with the participants of the CCE Tour talking about their experiences with new, self-made bamboo bike. Post from: Oswald Weiser’s Travel Blog. 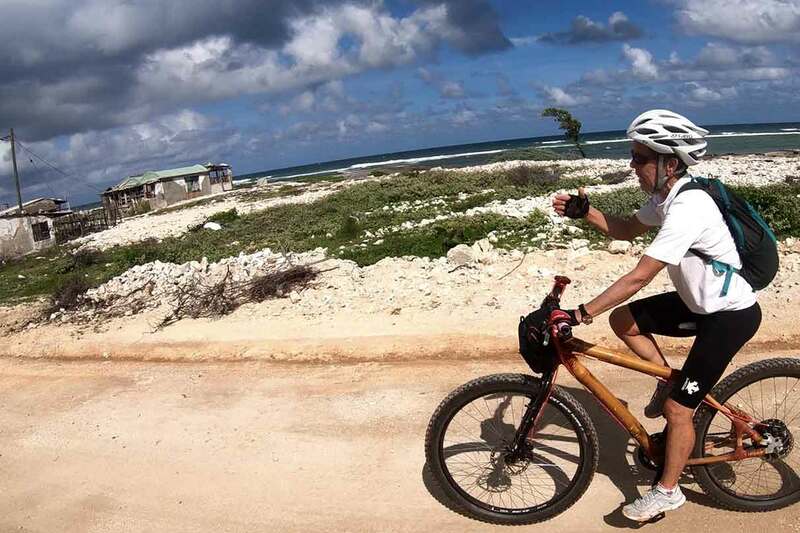 Currently he is travelling around the world to meet Bamboo Bike builders.